Air-Cooled Chiller rental units can provide immediate emergency cooling while repair or replacement equipment is being installed. Industrial chiller rentals can also be used to cool large events or halls with little set up time required. These trailer or skidded mounted chillers can be promptly mobilized quickly and freighted to your facility overnight and hooked-up in less than a day anywhere in southern California in most cases. These units are available in a variety of cooling capacity from 10 tons to 500 tons per trailer and 208 volt / 230 volt / 460 volt three phase power configurations. Each chiller comes with a reasonable amount of cam lock hose and power cabling which can be readily connected to your facility points of mechanical and electrical points of connection. If electrical power is not available we can also provide a portable mobile rental diesel fueled generator to power the rental chiller. Air Cooled Chillers have been used for temporary cooling for hospitals, office building, schools and many other commercial applications. Low temperature chiller rentals are also available on our website for chilling movie sets, industrial ice making and process applications. Cooling Tower rentals are typically used as a replacement for broken cooling towers in factories and large industrial environments. These cooling towers can also be used with one of our water-cooled chillers or packaged units to provide a very energy efficient and quiet cooling system. 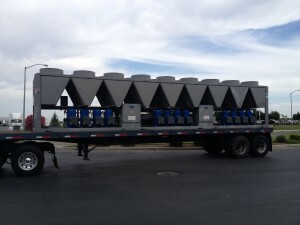 Cooling Towers can be delivered to your facility within 24 hours on a trailer or skid frame. Cooling Tower rentals come in small, medium and large sizes up to 300 tons of cooling. Water Cooled Chillers are most commonly used for large industrial facilities. Our Water Cooled Chillers can be rented in sizes from 6 to 500 tons and will be delivered on a skid or trailer. Use them with one of our rental cooling towers to provide a complete energy efficient and quiet cooling system. These useful chiller rentals can be delivered within 24 hours to any location in the LA area and out to a 100 mile radius from Downtown Los Angeles.